Laura has lived in Brunswick all of her life and attended Brunswick High School. 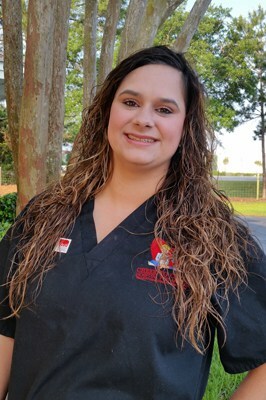 She graduated from Abraham Baldwin Agricultural College in 1986 with an associate degree in Veterinary Technology and became board certified that summer. After graduation, she worked with Dr. Billy Weeks and then Dr. Terry Nobles. 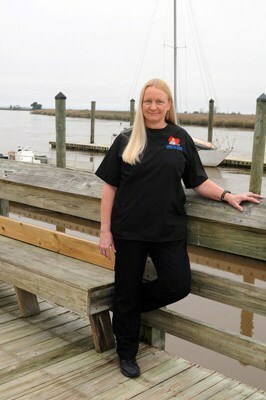 Laura started working with Cheek to Cheek Hospital for Animals in April of 1994 when the practice opened. Her duties include lab work, anesthesia, dentals, radiography, and client education. She has 4 cats. Cheryl has worked with Cheek to Cheek Hospital for Animals since July of 1994. She is one of our Patient Care Representative, as well as being able to help out in all areas of the hospital. She is married to Gary Turner and has two grown sons and five grandchildren. She also has a barn full of horses and four cats. Her hobbies include trail riding and timed running events with her horses. Trish is one of our Client Care Representatives. She has returned to work with Cheek to Cheek Hospital for Animals and was one of the original staff members when the hospital opened in 1994. Trish brings with her years of experience and a sincere love for animals and people. Marilyn is one of our Patient Care Representatives and has worked with Cheek to Cheek Hospital for Animals since November 2006. 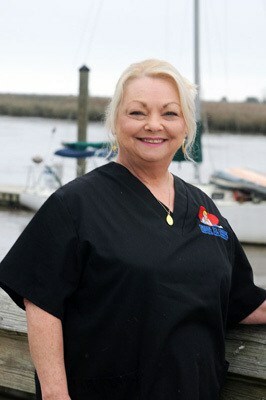 She moved to coastal Georgia in 1974 and graduated from Coastal Georgia College with an Associated in Science degree. Marilyn worked with other veterinarians, the local Humane Society and her own pet store before joining Cheek to Cheek Hospital for Animals. She has 11 cats, 1 dog, 13 birds, 1 turtle, 1 tortoise and 2 aquariums. Her hobbies include tennis, gardening, music and crafts. Heather is one of our Client Care Representatives and has worked with Cheek to Cheek Hospital for Animals since May 2007. 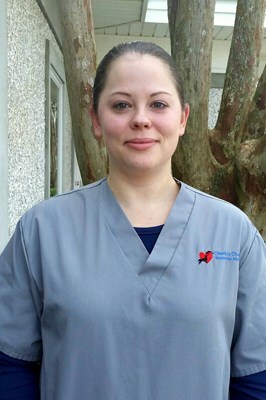 She came to CCHFA with years of experience in veterinary medicine. She moved to Brunswick in 1990 from Florida. She graduated from Brunswick High in 1999. GO PIRATES! Heather has 2 children, 4 dogs and 3 cats. She enjoys photography, scrap booking and baking. Ellen is one of our Client Care Representatives and has worked with Cheek to Cheek Hospital for Animals since August 2013. She has twelve years experience in Customer Relations and is here to provide the best care for your pets and you. She is married to Windell and has lived in Brantley County since 1994. Ellen has four Chihuahua’s and a Dachshund. She enjoys fishing, jet ski riding, four wheeling, and lying in the sun. 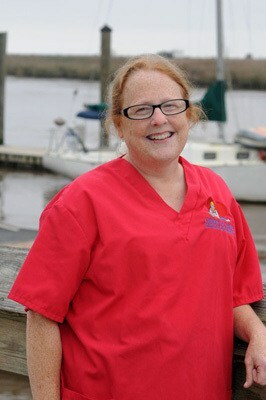 Toni is one of our Patient Care Representatives and has worked with Cheek to Cheek Hospital for Animals since May 2009. Multiple rescue pets find their way into her heart as she has 8 dogs, 2 turtles, 1 gerbil and a huge aquarium. Toni loves flowers and enjoys gardening and decorating. Stephanie is one of our Patient Care Representatives and has worked with Cheek to Cheek Hospital for Animals since January 2016. She graduated from the College of Coastal Georgia in 2015 with a degree in Applied Science. She has lived in Brunswick since 2004. Stephanie has 3 cats and enjoys painting and cooking. Leanna is one of our Patient Care Representatives and started with Cheek to Cheek Hospital for Animals on April 24, 2017. She is married to Trenton Rehms and they have two beautiful children, a son and a daughter plus a bulldog named Baby Girl. Leanna’s hobbies include going to the beach and spending time with her family. May is one of our Patient Care Representatives and has worked at Cheek to Cheek Hospital for Animals since July 2017. She currently attends Penn Foster College for Veterinary Technology. May is married with a son and 2 dogs. Bethany began working at Cheek to Cheek Hospital for Animals in March 2018 as one of our Patient Care Representatives. She currently attends college at Coastal Georgia where she’s working towards her Degree in Veterinarian Medicine. She has 2 dogs and 2 cats.